Wastewater pre-treatment units are designed as a mechanical screening solution for pre-treating wastewater from septic tanks, septage hauler trucks, and sewage holding tanks. Constructed on 304 SS parts and the integrated washing system make this equipment durable for long-term use. Many wastewater treatment plants process municipal, industrial and septic tank sludges that contain debris and inorganic solids such as hair, plastics, grease and hygienic materials. This debris can negatively impact downstream equipment by clogging pumps and valves, decreasing the effectiveness of aeration, dewatering and filtering equipment. 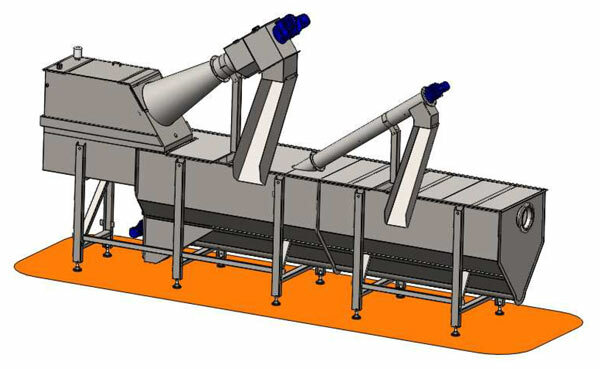 Ecologix sewage acceptance systems are fully automated and designed to remove debris and inorganic solids that typically pass through a conventional bar screen. Initially, wastewater is screened to remove large particles which are then washed to remove organic matter and compacted before being discharged. The screened wastewater then flows into the sedimentation tank, where grit settles into a hopper and is subsequently extracted by an inclined screw conveyor. Water treated in these units typically achieves TSS of <500 mg/L and 95% removal of grit material.